Thank you to everyone who participated in the 5 Stones Brewing 5k Beer Run! Pictures are up on our Facebook page HERE. This fun and social 5k was a SNEAK PEEK at 5 Stones’ new taproom and brewery. We think they have something special there and wish them the best of luck! It was very generous for them to have us out before it was open to the public. We were the first event ever at 5 Stones new brewery! Join us in Austin, TX for the sixth and final 5k beer run in the Texas Beer Series. Race info available HERE. 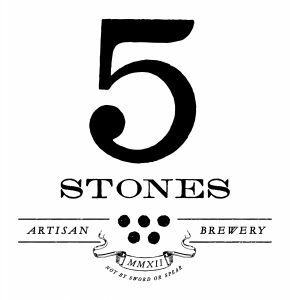 Please confirm that you have the correct address for 5 Stones Brewing. Some maps will bring up their old address in Cibolo, TX. A great story to tell your sorry friends who didn’t join you! Registration is $45! Sign up soon to guarantee your spot in this FUN and SOCIAL 5K! **Make sure to register by Sunday, October 1st to guarantee your shirt size! ** We are ordering extra shirts, however participants who sign up after October 1st aren’t guaranteed a shirt. 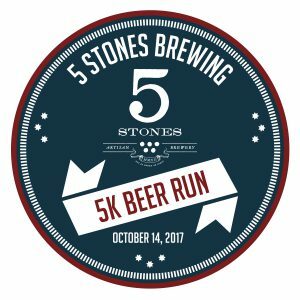 The 5 Stones Brewing 5k Beer Run is a unique event You don’t have to wait until the end of the 5k to enjoy 5 Stone Brewing’s great beer; we will have samples for you throughout the race! Everyone will get to enjoy their first sample of beer right away, because we will begin the race with a celebratory “cheers!”. This 5k course is a five lap, 0.62 mile loop around the brewery. This race that is not a paved course. It will be a mix of gravel road and some grass. The race is still family and pet friendly, it just might be a little bumpy! After each lap, you will get another sample of AMAZING 5 Stones Brewing craft beer! When you finish the 5k you will receive a souvenir pint glass as your finisher’s award. Pint glasses are our favorite kind of finisher’s medal! Location This event will be at 5 Stones Brewing’s NEW taproom and brewery at 11335 FM 1863, New Braunfels, TX 78132 north of San Antonio and West of New Braunfels. Root Beer Division This is a family friendly event! For participants under 21 years old, designated drivers and non-beer drinkers, we will have a Root Beer Division as well! We will have root beer and water on the course and the Root Beer Division participants will still get the same swag as the Beer Run participants. Packet pick up will be onsite at 5 Stones Brewing’s taproom and brewery from 12pm-1:45pm on race day, Saturday October 14th, 2017. Come out early to get a good parking spot and enjoy a pint before the run. The 5k run will start at 2pm. All registrations are final. There will be no refunds or transfers. Thank you for understanding.